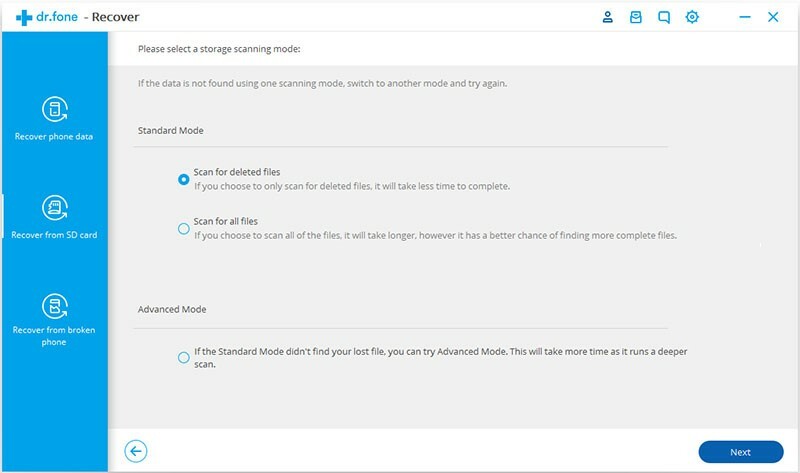 Have you ever had the similar experience mentioned above or are you facing this kind of annoying dilemma – Losing the important data from your Android SD Card without backup? If so, let’s see whether we can solve this problem and how to get the deleted files back. Part 2: How to Store Files Appropriately? 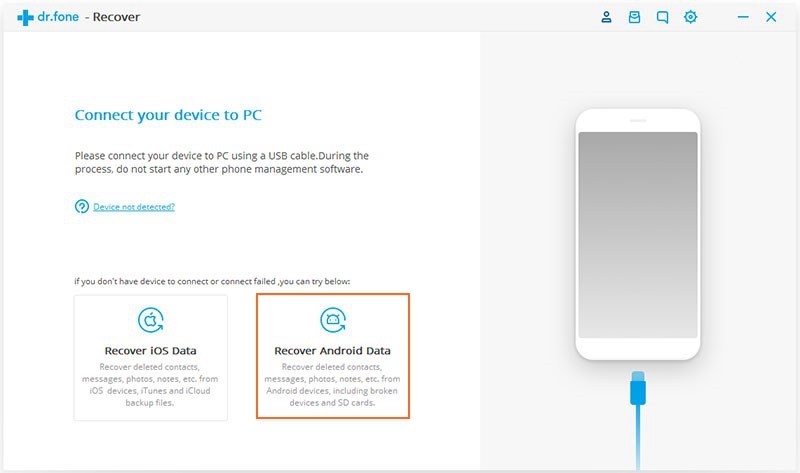 On handling this kind of trouble, we should have the aid of an incredible tool – Android Data Recovery, which is efficient and easy-operated, supports to regain data including photos, messages, WhatsApp Messages, contacts, videos and more data from SD card of Samsung, HTC, LG, Sony, Moto, HUAWEI… Please follow the given steps to regain your data. Step 1:Launching the software, click on “Recover” from the interface. Next choose “Recover Android Data” . 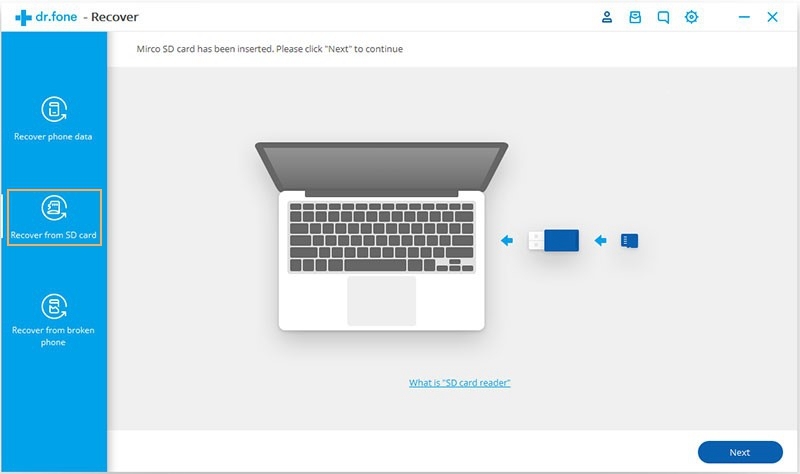 Connecting your SD card to your computer or laptop through a SD card reader or TF card adapter, then click on “Next”. Step 2:Then we will select the data source, just as the “Removable Disk” in the following picture and click on “Next”. Step 3:You have some choices on how to scan these files. You can do a quick scan for deleted files, which is a surface level scan or you can scan for all files, which goes much deeper, however, it takes a lot more time. Besides, you can also go even further by turning into Advanced Mode, which takes even longer. In most cases, you can just do a simple scan first. Then click on “Next”. Step 4:Wait for the scanning process. When the scanning finishes, you can preview the files that you want to recover and select them, then click on the “Recover” button and finally select the output location on your PC or Mac. It is such a simple way to recover lost data from SD card, isn’t it? Although this handy tool can help you a lot, it is still essential to be aware of how to reasonably store folders in your devices. It is not a single case that phone user usually run out of space without noticing it, for nowadays, a large number of apps, photos, messages, etc, need to be put in storage in a smart phone. Therefore, you’d better know that it is reasonable and recommendable to save data in different places according to their importance and size. SD card is an universally used way to cover the limitation of internal storage by expanding it, in spite of some obvious drawbacks mentioned above. Since music and videos might be updated quite frequently, you’d better save them into an extra micro SD card, leaving the internal storage for apps and essential system cache. Cloud storage is certainly a great choice for long-term preserved data such as commemorative photos and important documents, which are also great-space-consuming data. Moreover, it would be more convenient and fast for you to share them with your friends through cloud service. Have you mastered this skill of storing data cleverly? With the aid of these two “assistants”, releasing the internal space would become a much easier task! The internal storage of smart phone, which is mostly used for storing the operating system and applications, is one of the most important factors that should be considered before buying one. Nevertheless, even if your device does not have a large amount of storage, there still are some ways to expand it to meet your need. As for the external storage, there are two types, including Micro SD and cloud storage. The advantages and disadvantages of these two storage should be known before you are to choose one of them or both. 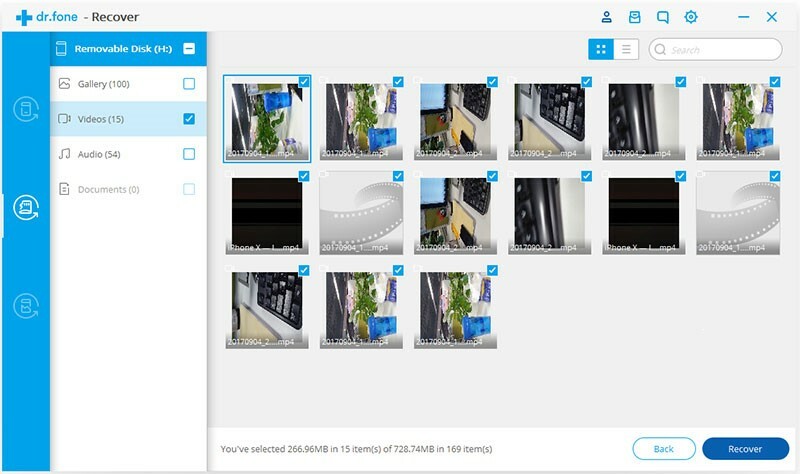 Compared to cloud storage, which needs network connection, Micro SD card runs faster. The data stored on it can load instantly. A class 10 micro SD card is to be recommended, because the higher the class number, the faster the card. Micro SD card is a super economical and handy way to extend your phone’s space. Amazon is a wonderful access to buy an SD card. Since class 10 card gives the highest speed and the best performance, we recommend to purchase a good quality class 10 card, and you’ll pay around £10 for 16GB of storage and £20 for 32GB of storage. 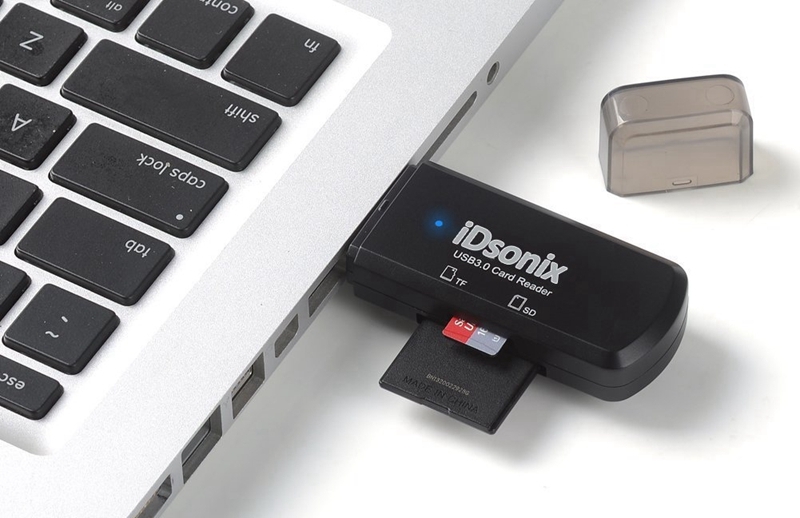 Conveniently, the data stored in a micro SD card can be swapped between different devices. What you need to do is simply take the SD card out of the device and insert it into another. Multimedia files such as pictures, videos and music can be easily carried from one device to another via a micro SD card. For example, imagine that you are a big fan of classical music and you want to listening to it all the time. However, your phone is run out of space, in which you have already installed so many applications. In this case, you could just download the pieces that you like on your PC first, then transfer them into an SD card and finally into your smart phone. With the assistance of the micro SD card, now you can enjoy the music everywhere. Through Cloud services, you are able to store files from your phone to your tablet or laptop and vice versa. The function of synchronizing files helps to get the same data through different channels and makes it more convenient to share files with friends and families. Unlike internal storage and micro SD card storage, Cloud storage has your data backed up online automatically, which brings much more security. Even if you lose your phone, all of your cloud stored data will still be available. Micro SD cards do not have the function of backup, so that all of your data will lose if the SD card is out of order. When accidentally your phone is lost, everything stored in the SD card is readily available for some evil attempts, for it cannot be protected by the lock screen. In most cases, micro SD cards are only an extra storage for multimedia files like photos, music and videos. In other words, mostly, applications are not allowed to install in an SD card, which sets a great limitation into its usage. Cloud storage requires an online condition, that is to say, the data saved in a cloud storage are only available when you have working internet connection. If you go to somewhere outside the network coverage, the cloud storage does not work, which shows the instability of this kind of storage. Compared to internal and SD card storage, cloud services are a little bit slower, because it takes about 4 seconds to download a typical photo, while the former two can load instantly. By the way, the mobile broadband speeds have been improving step by step. Since you should download the files from the cloud storage before using, this operation will certainly run out the number of your monthly download fast. For instant, a 100-picture folder will cost around 250MB of data. A third party company is involved when you are using a cloud storage, which means your privacy may be invaded without your consent under special condition such as the government agencies are undertaking investigation or hackers attempt to steal your data through cloud service.